I'll admit it right now. I'm a Satoshi Kon fanboy. 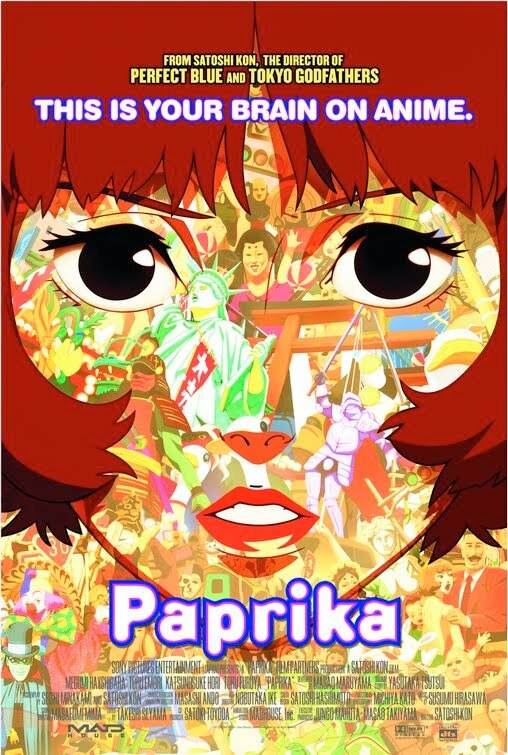 I saw Paprika as soon as it came out, just to see if the trailers were not deceiving me in the belief that Satoshi Kon may have just topped the amazing Millennium Actress. Welcome to Satoshi Kon's Paprika, a smorgasbord of themes and ideas mashed together into a single 2-hour dream sequence. The film takes much of its style from some of Kon's previous works, particularly Perfect Blue and Millennium Actress, but creates a very different feel than any film he has done before. Dr. Atsuko Chiba is a researcher working on a new piece of technology called the "DC Mini." It is a machine that connects to someone's ear, allowing "psycho-therapists" to view and even enter the dreams of their patients, and therefore help solve their mental problems. The typically uptight doctor uses her lighthearted alter-ego Paprika when she enters the dreams of others. However, the powerful machine has now been stolen, and someone is using it to broadcast their dreams into the waking minds of their victims. Paprika, Atsuko her partners Tokita, Osanai, their Chief, and the detective Konakawa, who has his dream visited by Paprika earlier in the film, try to find and stop this "psycho-terrorist" before he or she can kill more people and discredit the DC Mini. As most have come to expect from Kon and his mainstays at Madhouse, Paprika has beautiful animation. It provides fantastic contrasts between the gritty details of real life and the colorful and whimsical characters of a dream. In addition, the film provides some truly exhilarating scenes where reality and fantasy blend, and the smooth animation and screen warps achieve this effect spectacularly. The character designs are vivid and drastically different, making it quite easy to tell the differences between characters. Susumu Hirasawa's score is yet again the most memorable element of the entire production. He provides breathtaking technopop-style vocals and background music that fully compliment Kon's fantastic dream vision. Sadly, Paprika does not deliver as well as I would have liked when it comes to plot. It's not that the writing is bad, but simply overcomplex. The use of dreams as a theme makes for some very interesting situations, but also makes the film convoluted and hard to understand. The ending, while epic and truly exhilarating, was dissapointing as well. When I found out who the psycho-terrorist really was, I was very disappointed in their identity and motives. Even so, the characterization is very well-done, especially the dynamic relationship (and eventual conflict) between Atsuko and Paprika. The Japanese voice acting is high-quality, with the famous Megumi Hayashibara voicing both Atsuko and Paprika. She does a great job pinning down the harsh, down-to-earth tones of Atsuko while subsequently sounding like a young girl for Paprika. The supporting characters are also fine, though their acting is nowhere near as important as Megumi's. Many people have already said it, but I'll say it again: Paprika is an experience. It may have flaws in its plot, and it might not make you think as much as Perfect Blue, but this movie is a joy to watch. If I had to choose a single scene that pins down the emotions that Paprika bestows upon its viewers, it would simply be the opening credits. The scene shows Paprika moving around the city as she merges between reality and dreams. With Susumu Hirasawa's main theme playing behind, and Satoshi Kon's trademark directorial style determining the action, this scene is absolutely breathtaking. As you watch Paprika, Satoshi Kon is able to take you into a world far away from reality. A world so strange and imaginative, so powerful and breathtaking, you might even call it...a dream.